As readers of this blog will know, I am a big fan of hotels with history; known to go weak at the knees at the sight of a crisp clipped lawn, I have a particular weakness for colonial-era buildings (as my post on the subject will testify); Raffles Singapore, the Governor’s Residence, Amagalla, you name it. It was therefore no surprise that I found myself head-over-heels in love at first sight on my arrival at Falaknuma, the epitome of a hotel with a colourful past. 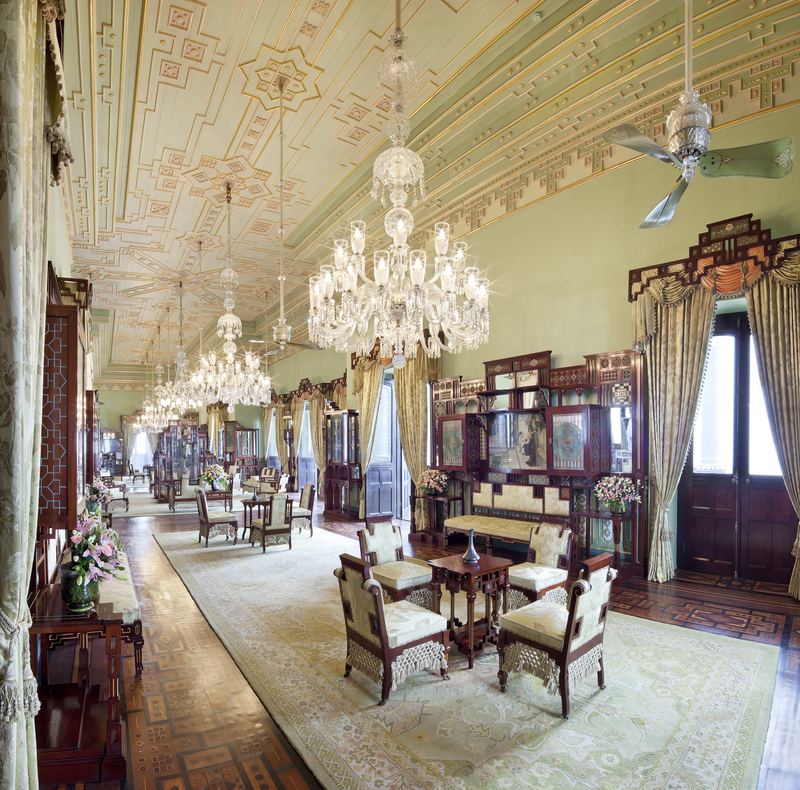 Built in 1894, by the Prime Minister of Hyderabad (brother in law of 6th Nizam), Falaknuma Palace was designed as a showcase of the best of the best. So magnificent was the finished product, so the story goes, the Nizam at that time insisted on moving in instead. 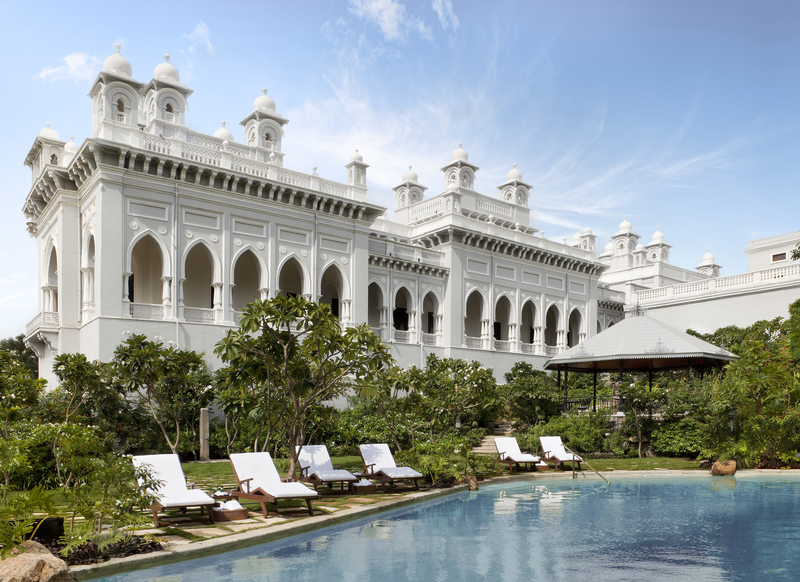 When Taj Hotels began their extensive renovation (over 9 years of work), they did so with the consultation and advice of Princess Esra, ex-wife of the former Nizam of Hyderabad, and an authority on the city’s Royal Palaces. This sensitive restoration has allowed the palace’s rich history to be brilliantly showcased; the beautiful murals, carpeted staircases, antique furniture, photographic portraits, Venetian chandeliers, Corinthiam columns and landscaped gardens appear as they must have done at the time of the palace’s birth, a time when King George and Queen Mary came to stay and when the 6th Nizam was classified as the second richest man in the world. 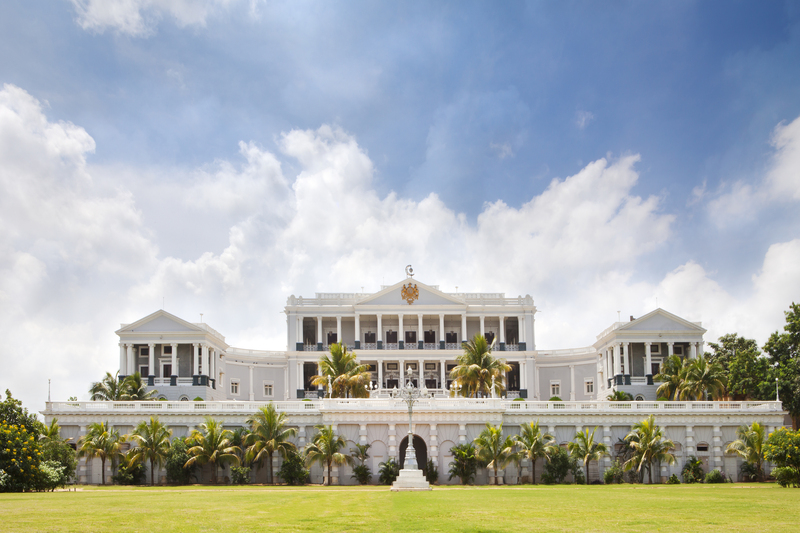 A stay at Falaknuma Palace allows you to dive back into the past and get a taster of what life must have been like in Hyderabad’s golden era. 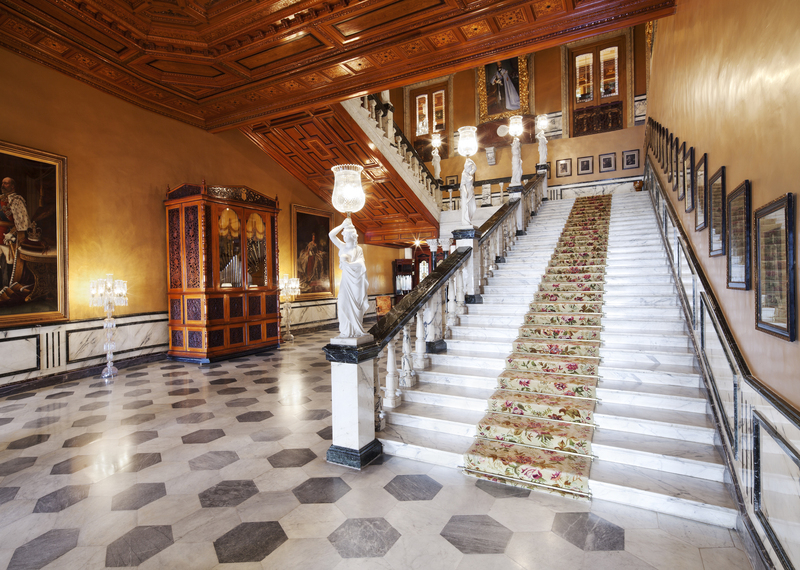 When you’re staying at a hotel with as much history as Falaknuma Palace, it makes sense to learn a little about it, in order to do your stay justice. In true Taj style, the team at Falaknuma Palace have made it easy for you; all you need to do is turn up at the lobby at 5pm. You’ll be met by the in-house historian (yes, that is an actual job) for an hour walk-around the main building of the palace. 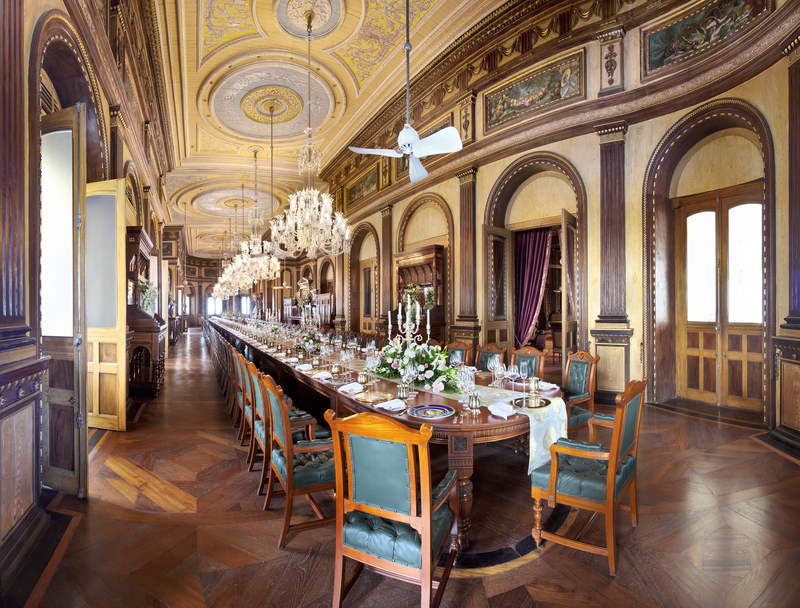 The historian is full of entertaining stories and mind-boggling facts (Falaknuma Palace is home to the world’s longest dining table no less) and will bring the palace’s history to life as you walk around the many different rooms. About half way through, the team obligingly cracks open a bottle of champagne, and pour you a glass to walk around with. After all, they wouldn’t want you getting thirsty. 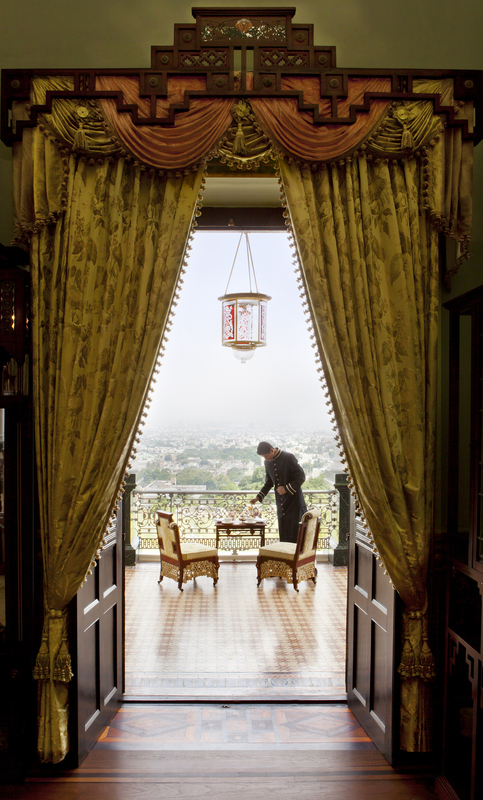 Perched high up on a 2,000 foot hill, Falaknuma Palace earns its title of ‘Palace in the Sky’. After a short drive up the hill your car drops you off and an achingly romantic horse and carriage trots you to the front of the palace so that you approach the property in such a way to do it justice. As you turn around the corner through the last entrance gate, the city appears in front of you, like a sparkling carpet below (if, like me, you arrive at night). Everything about being so high up elevates (!) your stay; the views are insane, a light breeze blows through the corridors, sunrises and sunsets take your breath away (especially sunset seen from the first-floor front terrace) and there is an overriding sense of calm and isolation – perfect if you’re looking to get away from it all for a few days – which makes you almost kid yourself that the palace belongs to you. And that you’ll never have to leave. Sadly, on both fronts, this wasn’t the case. I’ve stayed at a lot of Taj hotels, and visited a lot of their Jiva spas, but the spa at Falaknuma Palace really impressed me. From the minute you arrive it feels as though everything has been thought of; at the door you are presented with an inviting welcome tea (mine was fresh lime, mint and jaggery) while you fill in the necessary bits and bobs. Before long you’re whisked off to one of their absolutely enormous spa rooms which are light and tranquil, the perfect space to completely relax and unwind. Should your treatment be just a bit too stressful, there is also a post-treatment relaxation room which comes with a heated reclining lounger, to keep those muscles warm. 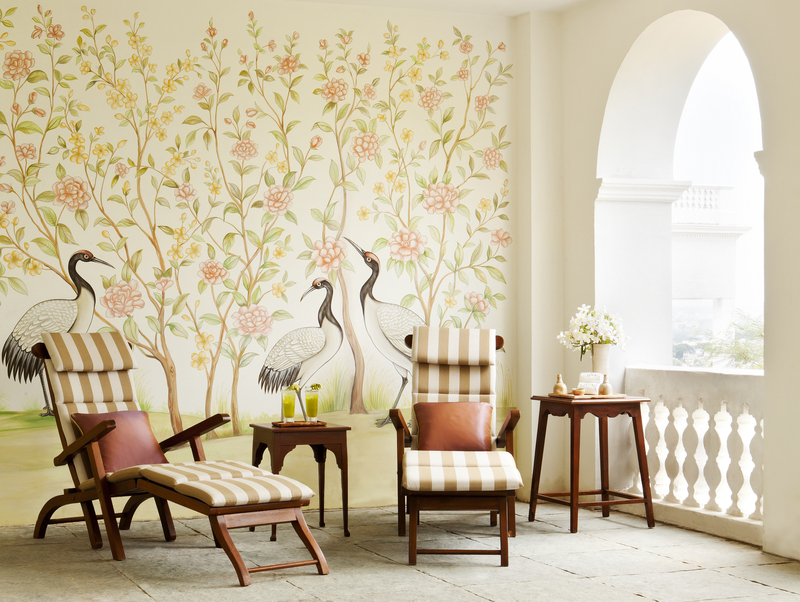 You’ll also find sun-loungers on the shaded terrace, from where you can look out over the grounds, or admire the pretty murals which surround you. All in all, this is the spa is completely blissful. From the minute that I cruised into Falaknuma Palace on my own horse and carriage, I knew that I had arrived at a special place. But, the part of my stay which has stayed with me the most is the exceptional service and dedication of the staff, who are simply out of this world. We were met off the carriage and welcomed to the palace, before climbing up the steps where rose petals cascaded down on to us from the terrace above; much to the embarrassment of my male companion, I squealed with surprised delight. When we left for an early flight a couple of days later, more roses tumbled down at the exact moment of our departure, I was stunned by the work and planning that I know goes on behind the scenes to organise this kind of ‘small’ detail. Our dedicated butler was there to grant our every wish, the restaurant staff took the time to explain the local delicacies, the pool assistant served us drinks, fresh fruit salad and assorted sun blocks and creams; wherever we went we felt completely and utterly spoilt; no mean feat when the hotel is normally dealing with 60 rooms full of demanding clients. Hyderabad is one of India’s ‘foodie’ destinations, a city where the cuisine is unique and worth travelling several hundred (or thousand) miles for. Famous for its Biriyani, which originates from Persia, this is a place to indulge in this dish of fluffy rice and tasty mutton. When dining at the hotel’s signature Indian restaurant, Adaa, we asked the waiter for his recommendations. He didn’t disappoint us; we started the meal with an incredible bowl of haleem, the food which Muslims eat to break the fast of Ramadan, a rich and delicious concoction, eaten alongside the region’s famous caramelized onion bread, kulcha. Everything we ate and drank at the palace was excellent; whether it was small cubes of tandoori paneer for lunch, a fresh lime sorbet, light biriyani, an amazing array of warm pastries and fruit smoothies for breakfast, inventive cocktails and bar snacks as the sun went down or the rose lemonade which saw us off on departure. If you are going to be staying at Falaknuma Palace, or visiting Hyderabad, I have one piece of advice, get stuck into the local cuisine, you won’t regret it! When staying at a hotel, a normal guest just sees the room they are staying in, or at the very most the room of their travel companions. As a travel blogger and hotel aficionado, the doors of the majority of rooms are opened for me to compare and contrast; from opulent presidential suites and three-bedroom villas to slightly more modest bedrooms where the majority of people stay. 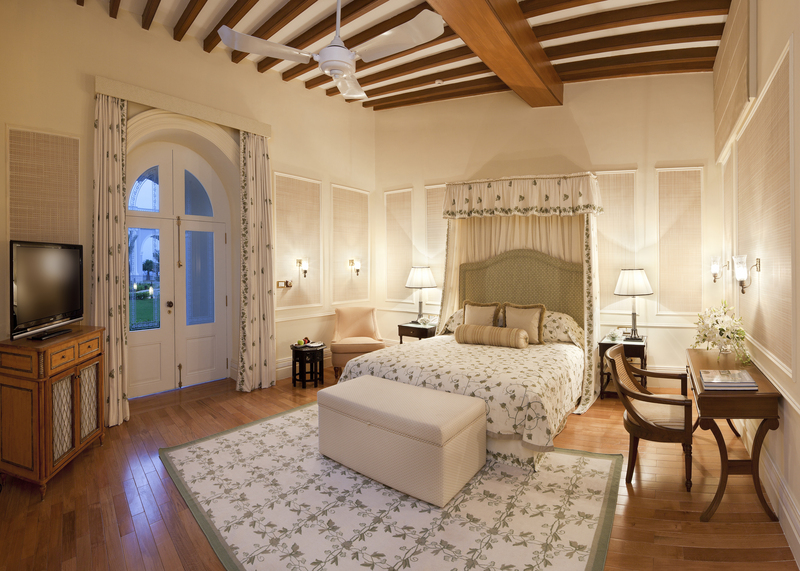 My favourite rooms at Falaknuma Palace are the Historical Suites; with only three, these are in high demand and for good reason too. Located at the front of the palace, the ‘pincer’ suites (as they are known, for being located in the pincer of the scorpion shaped palace) have killer views, sweeping terraces (where you can take breakfast – why not! ), your own private corridor leading from the main building (it might come in handy), four poster beds and a cracker of a dressing room; all in all, the perfect package! If you’re looking to stay at the palace and want the low-down on the best room numbers to book (before everyone else does) just get in touch, I’ll be more than happy to help. As those who follow my adventures around India will know, Taj Hotels have an amazing collection of Palace Hotels which include the world-famous Taj Lake Palace in Udaipur, Rambagh Palace in Jaipur, Taj Mahal Palace in Mumbai and the dramatic Umaid Bhawan Palace in Jodhpur. The jewel in their crown, Falaknuma Palace, is also the last point in my palace pentagon – the opening of Falaknuma means that travellers to India can visit the country’s most spectacular cities in truly spectacular style, travelling in the style of modern day Maharajas and Maharanis. My favourite hotels are always those that feel like an attraction in their own right, where you can do sightseeing from the pool, or as you have your dinner, as well as exploring further afield. The Taj Palaces do just this; each one transports you back to an age of opulence and extravagance, each different and magical in their own way. No man is an island, and no hotel can be separated from its environment. I travelled to Hyderabad to stay at the fabled Falaknuma Palace, but also to explore this completely underrated city. One of India’s ‘metro cities’ (the others being Delhi, Calcutta and Mumbai), Hyderabad is a city of main cities. There is the high tech, or ‘cyber’ city, where global players like Facebook, Google and Deloitte reside in towers of shiny glass; the first citadel, found within the walls of the Golconda Fort; the colonial-era city of Secunderabad, with its churches, bungalows and clubs; and the planned city, with its four-legged Charminar and Jama Masjid. Falaknuma Palace looks down on them all, and is the perfect base from which to explore the many wonders of this city of contrasts. 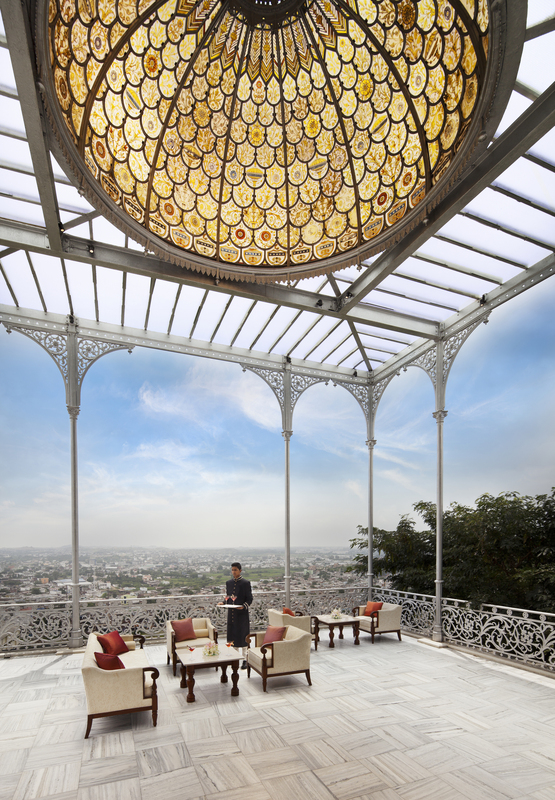 If you are planning a stay at Falaknuma Palace, or in Hyderabad, and are looking for an expert guide to show you around and help you get the most out of the city, drop me an email and I’ll put you in touch with a team of world-class guides that operate solely in Hyderabad. 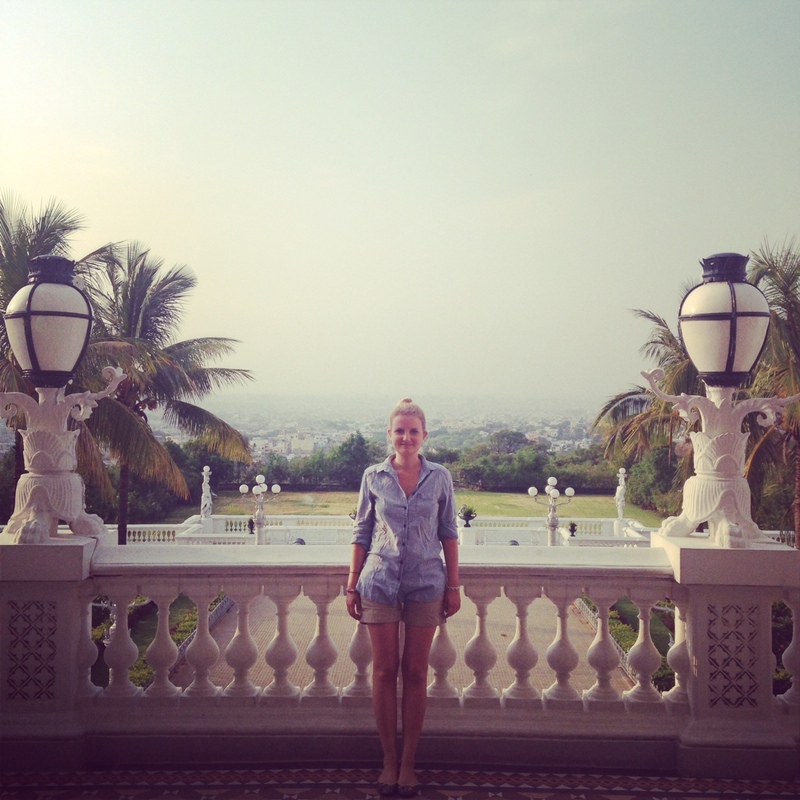 If you want help planning a trip to Falaknuma Palace, have any questions on my stay, or have been there yourself please just get in touch – I’d love to hear from you. Thanks for reading Beth – I can confirm that it is pretty amazing and a really difficult place to leave! 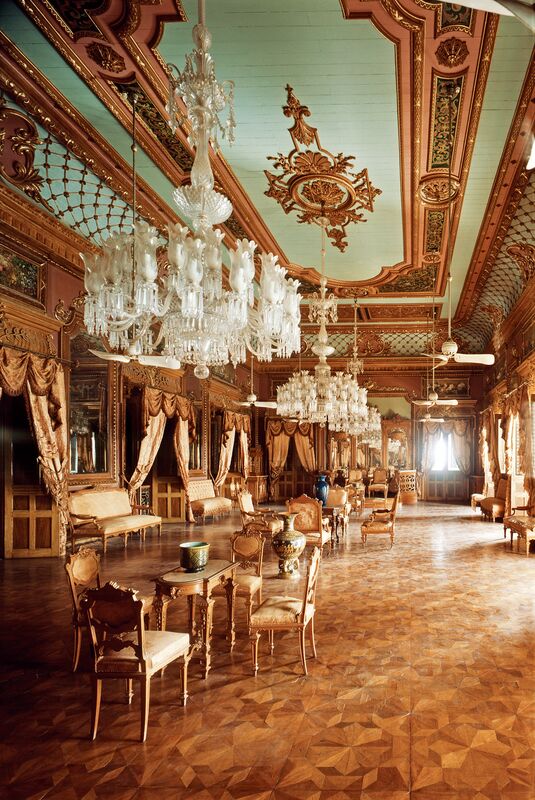 I really liked the way u have written about Falaknuma palace and Hyderabad. I felt ur words have truly done justice to this amazing palace as well as Hyderabad. And u wud b delighted to know that this appreciation comes from a Hyderabadi! Thanks for reading and for your comment Mamoon! It’s a great compliment coming from somebody Hyderabadi! Do you have any tips on Hyderabad as I definitely plan to go again!